*I received admission to this movie for myself and my kids for the purpose of writing this review. All opinions posted here are mine and mine alone. My kids have been inspiring much jealousy in their friends this week, because Ethan and Vivian have already seen Cars 3 and everyone else has to wait until Friday. These things matter a lot in elementary school! We were so happy to get to attend a screening of the long-anticipated movie on Monday night. What did we think? We loved it! Read on below! We've been big fans of the Cars movies since the beginning. The first one stole our hearts and, even though it was much different than the original Cars movie, we actually liked Cars 2. Cars 3 felt like a return to the feel of the first movie. My almost-10-year old son, who loves action and explosions said that he liked this one more than the first movie but less than the second one. Vivian and I both decided that Cars 3 was our favorite. Other than the crash (which is shown in the trailer for the movie), there is no violence and no scary parts. My daughter is very sensitive to this type of stuff, but there was nothing in the movie that bothered her. Our screening was attended by a number of other small children, who also appeared to have no issues. Having recently turned 40, I appreciated the story line that focuses on Lightning McQueen not being a young race car anymore and finding his strengths in a new phase of life. There were good stories about friendship and support and seeing the best in others. I had a tear or two in my eye at the end- happy tears! The movie dragged slightly for me in the middle, but I do have a short attention span, so that wasn't unexpected. Overall, it's another Disney home run and I'm sure will be another classic addition to everyone's movie collections. All the thumbs up! Review: Pley presents Disney Princess subscription boxes! *Disclosure: I received this box to review for myself. All opinions posted here are mine and mine alone. My daughter, Vivian, is 7 years old and is always excited when boxes come in the mail. Even if they are just full of uninteresting things like cat food or parts for her dad's bicycles. But recently we received a box that was for her, and it lived up to all of her hopes and dreams! It was a Disney Princess mystery box from Pley, and it was wonderful! 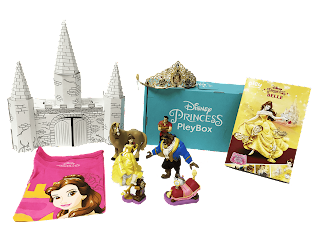 These Disney Princess mystery boxes are available every two months and each one contains 4-8 Disney Princess toys, accessories and clothing. This month's box had a Beauty and the Beast theme. Vivian's box had a great selection of toy figurines, a very nice princess crown, and a pretty t-shirt. She really loved that the box transformed into a castle, which she had fun coloring with her grandmother. If there's a Disney Princess fan in your life, these subscription boxes would make a really fun gift! Vivian and I highly recommend them!